John James Audubon (Jean-Jacques Audubon) (April 26, 1785 – January 27, 1851) was a French-American ornithologist, naturalist, hunter, and painter. 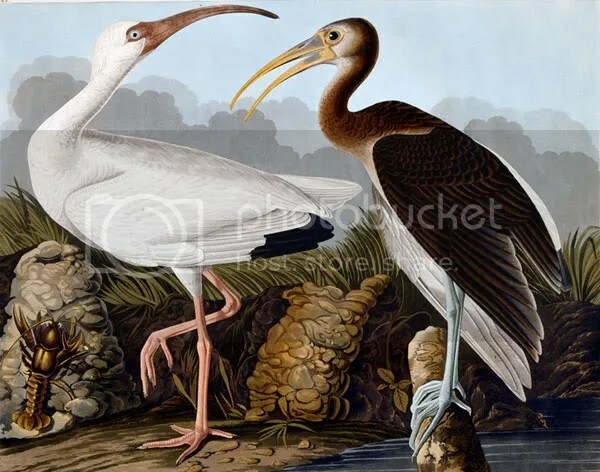 he was born in Les Cayes in the French colony of Saint-Domingue (now Haiti) and is famous for having painted, catalogued, and described the birds of North America in a manner far superior to any before him. His father hoped that the lead mines on the property could be commercially developed, as lead was an essential component of bullets. This could provide his son with a profitable occupation. Audubon met his neighbor William Bakewell, the owner of the nearby estate, whose daughter Lucy he married five years later. The two young people shared many common interests, and early on began to spend time together, exploring the natural world around them. Audubon then set about studying American birds with the goal of illustrating his findings in a more realistic manner than most artists did then. He began conducting the first known bird-banding on the continent: he tied yarn to the legs of Eastern Phoebes and determined that they returned to the same nesting spots year after year. He also began drawing and painting birds, and recording their behavior. Audubon continued his bird studies and created his own nature museum, perhaps inspired by the great museum of natural history created by Charles Willson Peale in Philadelphia. Peale’s bird exhibits were considered scientifically advanced. Audubon’s room was brimming with birds’ eggs, stuffed raccoons and opossums, fish, snakes, and other creatures. He had become proficient at specimen preparation and taxidermy. With his father’s approval, Audubon sold part of his farm, including the house and mine, as they deemed the mining venture too risky. He retained some land for investment, then went to New York to learn the import-export trade, hoping to find a business to support his marriage to Lucy. The protective Mr. Bakewell wanted to see the young Frenchman established in a solid career before releasing his daughter to him. On October 12, 1820, Audubon went to Mississippi, Alabama, and Florida in search of ornithological specimens. He traveled with George Lehman, a professional Swiss landscape artist. The following summer, he moved upriver to the Oakley Plantation in the Felicianas, where he taught drawing to Eliza Pirrie, the young daughter of the owners. After a short stay in Cincinnati to work as a naturalist and taxidermist at a museum, Audubon traveled south on the Mississippi. By this time He was committed to find and paint all the birds of North America for eventual publication. His goal was to surpass the earlier ornithological work of poet-naturalist Alexander Wilson, whose work he used to guide him whenever he had access to a copy. Audubon called his future work “Birds of America”. He attempted to paint one page each day. Painting with newly discovered technique, he decided his earlier works were inferior and re-did them. He hired hunters to gather specimens for him. Audubon realized the ambitious project would take him away from his family for months at a time. in 1824 Audubon returned to Philadelphia to seek a publisher for his bird drawings. He was rebuffed by many publishers, although he did met Thomas Sully, one of the most famous portrait painters of the time and a valuable ally, and had earned the enmity of some of the city’s leading scientists at the Academy of Natural Sciences. He took oil painting lessons from Sully and met Charles Bonaparte, who admired his work and recommended he go to Europe to have his bird drawings engraved. So in 1826 Audubon took his growing collection of work to England, taking a portfolio of over 300 drawings. With letters of introduction to prominent Englishmen, Audubon gained their quick attention. The British could not get enough of his images of backwoods America and its natural attractions. He met with great acceptance as he toured around England and Scotland, and was lionized as “the American woodsman.” He raised enough money to begin publishing his Birds of America. This monumental work consists of 435 hand-colored, life-size prints of 497 bird species, made from engraved copper plates of various sizes depending on the size of the image. They were printed on sheets measuring about 39 by 26 inches (660 mm). The work contains just over 700 North American bird species. The pages were organized for artistic effect and contrasting interest, as if the reader were taking a visual tour. The first and perhaps most famous plate was the Wild Turkey, which had been Benjamin Franklin’s candidate for the national bird. It lost to the Bald Eagle. Audubon also sold oil-painted copies of the drawings to make extra money and publicize the book. Audubon returned to America in 1829 to complete more drawings for his magnum opus. He also hunted animals and shipped the valued skins to British friends. He was reunited with his family. After settling business affairs, Lucy accompanied him back to England. He followed Birds of America with a sequel Ornithological Biographies. This was a collection of life histories of each species written with Scottish ornithologist William MacGillivray. The two books were printed separately to avoid a British law requiring copies of all publications with text to be deposited in Crown libraries, a huge financial burden for the self-published Audubon. Both books were published between 1827 and 1839. During the 1830s, Audubon continued making expeditions in North America. During a trip to Key West, a companion wrote in a newspaper article, “Mr. Audubon is the most enthusiastic and indefatigable man I ever knew…Mr. Audubon was neither dispirited by heat, fatigue, or bad luck”. he would draw during the day before returning to the field in the evening, a routine he kept up for weeks and months. In 1833, Audubon set forth from Maine accompanied by his son John, and five other young colleagues to explore the ornithology of Labrador. On the return voyage, the Ripley made a stop at St.George’s, Newfoundland and Audubon and his assistants documented 36 species of birds. In 1839 having finished the Ornithological Biography, Audubon returned to the United States with his family. He bought an estate on the Hudson River (now Audubon Park). In 1842, he published an octavo edition of Birds of America, with 65 additional plates. It earned $36,000 and was purchased by 1100 subscribers. Audubon spent much time on “subscription gathering trips”, drumming up sales of the octavo edition, as he hoped to leave his family a sizable income. Audubon made some excursions out West where he hoped to record Western species he had missed, but his health began to fail, Until In 1848, he manifested signs of senility, his “noble mind in ruins.” He died at his family home on January 27, 1851. Audubon is buried, close to the location of his home, in the graveyard at the Church of the Intercession in the Trinity Church Cemetery and Mausoleum at 155th Street and Broadway in Manhattan. There is an imposing monument in his honor at the cemetery, which is the center of the Heritage Rose District of NYC. Audubon’s final work was on mammals, the Viviparous Quadrupeds of North America, prepared in collaboration with his good friend Rev. John Bachman of Charleston, South Carolina. Bachman supplied much of the scientific text. The work was completed by Audubon’s sons and son-in-law and published posthumously. His son John did most of the drawings. Audubon’s influence on ornithology and natural history was far reaching. Nearly all later ornithological works were inspired by his artistry and high standards. Charles Darwin quoted Audubon three times in On the Origin of Species and also in later works. Audubon’s field notes were a significant contribution to the understanding of bird anatomy and behavior. Birds of America is still considered one of the greatest examples of book art. Audubon discovered 25 new species and 12 new subspecies. He was elected to the Royal Society of Edinburgh, the Linnaean Society, and the Royal Society in recognition of his extraordinary contributions to Natural history.